I forgot one major thing when packing essentials for our new place. My recipe box! It is long gone hanging out in the pod in storage somewhere. Besides missing all of our favorite, go-to recipes that are in regular rotation I am seriously missing my kitchen gadgets that make cooking so easy and fun like my crock pot, salad spinner, avocado peeler, etc. David really misses his grill and I do too. We have had to get creative just relying on the stove and oven. Lucky for us there is Pinterest and this is a good excuse to try some new recipes. 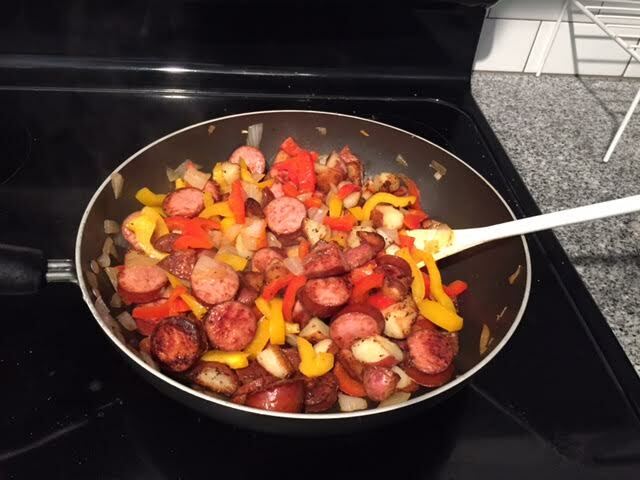 The recipe I made last night is called Kielbasa Peppers and Potato Hash Skillet. It was really tasty and easy to make if you don’t mind a lot of chopping. I like that it is a colorful dish with lots of vegetables. You could probably make it a little healthier by using turkey sausage instead of kielbasa, but I loved this recipe just the way it is. I always make David rank new recipes and he said that this one was a “9”. Will definitely be making its way into my recipe box…whenever that may be. Luscious! I am sooo lazy that chopping is NOT my favorite thing to do anymore. Maybe someday, when I’m not “working full-time) 😉 I’ll try this recipe. Dang, too bad recipe box is in your pod. But it won’t be there forever!